I am now starting to take bookings from stallholders for dates in 2018. Please get in touch by email to secure your place! Stallholders are welcome to book up to 6 dates per year but can go on the waiting list for as many other dates as they wish. Thank you for your continued support! This Saturday! – Are you coming? plus lots more besides! As usual, it’s FREE ENTRY and there’s always a lovely friendly atmosphere, so why not come and join us for a cuppa and browse all the fabulous items on offer! 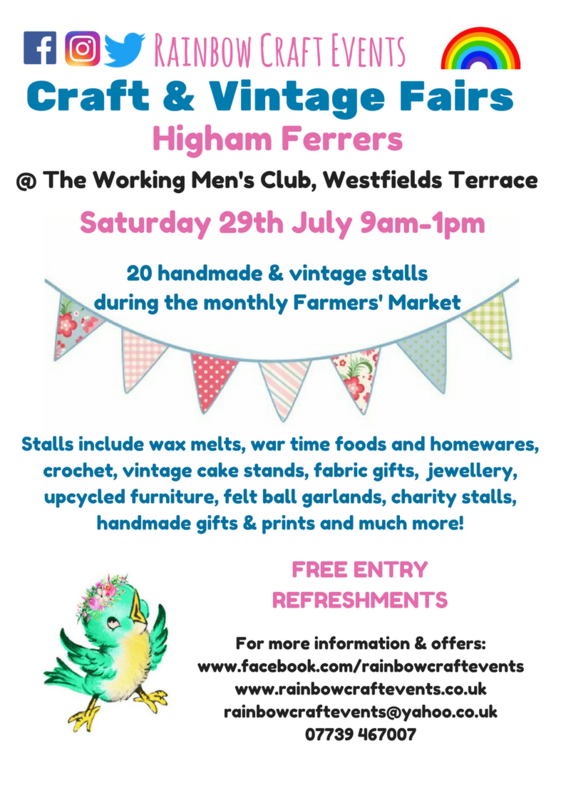 Don’t forget, it’s also the Farmers’ Market and there are lots of lovely shops open in Higham Ferrers so plenty to see on a Saturday morning. If you are able to help spread the word about these monthly events please share this post so we can tell as many people as possible about these great Craft & Vintage Fairs. Thank you and hopefully see you on Saturday! After a month off, we are back at the Working Men’s Club on Saturday 29th July 9am-1pm. As always it’s free entry and there are over 20 handmade and vintage stalls selling a fabulous range of high quality items. There is something to suit all tastes and budgets! 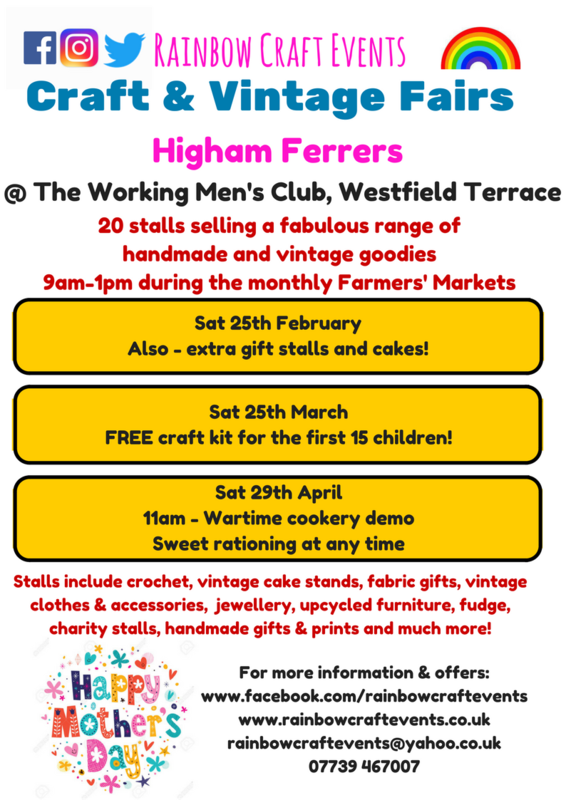 Remember, it’s also the monthly Farmers’ Market so it’s a great morning to visit Higham Ferrers and see what’s on offer. Well what a lovely morning Saturday was! 22 fantastic stalls with a stunning range of high quality handmade and vintage items. As always, I had many customers comment to me about how impressed they were with the stalls there – always lovely to hear! I’ve attached lots of photos to show a selection of items that were for sale. A couple of notes from the feedback (and things I’ve thought of too). Firstly, some stallholders commented on how nice it is to see other stallholders interacting with customers as they walked round – it really builds a lovely friendly atmosphere which is great and actually these stallholders certainly seemed to be making lots of sales! Definitely a good tip – having a chat with customers and having a big smile on your face is always a winner! There were an extra 5 signs out on the roads this month (10 lamppost signs plus 3 A boards) as well as the banner. When I get the next batch of flyers printed, I’ll also add a map to the back. Unfortunately lots of the signs were damaged by the storm a few days beforehand so I’ll do my best to replace as many as I can this month. 1000s more flyers to give out to schools too. If anyone knows of any clubs etc that I could deliver some flyers to as well that would be really helpful, thank you! Starting from the Market, turn left along the High Street then turn right by the Queens Head pub. Westfield Terrace is the first turning on the right, just before you get to the schools. It’s literally less than 5 minutes from the Market. This is promising to be a fantastic fair – as always!! This month’s stalls include vintage cake stands, crochet, yarn and patterns, carved and turned wooden items (raising money for the NSPCC), upcycled furniture, handmade fudge, milestone frames, fabric gifts, handmade and vintage home accessories, gold and silver jewellery, cards, personalised phot gifts, beaded jewellery plus more! Entry is always free and there will be refreshments – including cakes! – on offer too so please do come and join us. Everyone always comments on what a lovely atmosphere there is and it’s fantastic to see customers coming back regularly. See you there!